Search all 6,868,489 tickets today! How do I contact SlickTickets.com? How do I know my transaction is secure and my personal information is protected? If I order multiple tickets, are the seats all together? How do I know that the tickets listed on SlickTickets.com are authentic? Can I make last minute orders on the day of the event? How does SlickTickets.com offer so many tickets for so many events? Why can’t I purchase a single ticket? How does SlickTickets.com calculate the ticket prices on the website? Why are the tickets on SlickTickets.com above face value? Why are the prices different on the tickets since last time I looked? What is the Service Fee charge? Why would somebody else’s name appear on my ticket? What if my event is permanently cancelled? We are here to assist you! We have a support and sales staff available 24/7. Please fill out the form on our contact page and we will be in contact with you as soon as possible. If you would like to order over the phone, call our toll-free number and you’ll be connected with a ticket specialist that can assist you with your order. Again, feel free to contact us at any time; we would be happy to assist you! SlickTickets.com is on the cutting edge of technology and security. We provide our customers fast, reliable and the most secure access to over 87,000 events worldwide. We only use the best equipment from reputable technology vendors! Our data center servers are all restricted access for only a select group of employees so you can rest assured that your information is 100% safe and secure! Yes, all of our tickets are for consecutive seats in a row. If the seats are not together, this will be noted under the ticket listing. All of the tickets in the SlickTickets.com broker inventory are guaranteed to be 100% authentic and legitimate tickets. Please see our 125% "Worry-Free" Guarantee by clicking here. Yes, you can make last minute orders with SlickTickets.com. However, this will require some extra effort on our part, so we recommend that you give us a call for these last minute orders on our toll-free number so that we can fulfill your request. 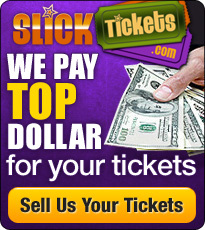 The tickets listed on SlickTickets.com are being listed by highly regarded Ticket Brokers from all around the country. These brokers go to great lengths to acquire tickets to sold-out and premium events. SlickTickets.com is able to offer so many tickets and a great selection of seats by bringing thousands of Ticket Brokers’ inventories together at one place. We monitor the response and performance of our Ticket Brokers to ensure the highest standard of relations to our customers. A broker is defined as "One hired for a fee to negotiate purchases, contracts, or sales." 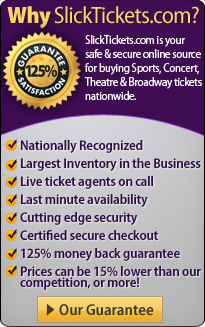 A ticket broker is a person who does just that. A ticket broker buys tickets outright from the seller in the hopes that they can sell them for a profit. If the market drops or the tickets don't sell, the broker incurs the loss. The other way a Ticket Broker can sell tickets is by taking the tickets from the seller on consignment and keeping a portion of the proceeds if they are sold. Either way, a ticket broker provides the link between buyers and sellers for a fee. We are able to offer so many tickets because we have relationships with thousands of highly regarded Ticket Brokers across the country. These Brokers are often unwilling to break up large numbers or even groups of tickets in order to provide a smaller odd number of tickets to a group of one, three or five. Our best suggestion is that if you have a small, odd number in your party, we recommend you look for an odd numbered group of tickets and choose from that group. If you are unable to find the amount of tickets you need, contact a SlickTickets.com representative by calling our toll-free number or emailing us and we’ll do our best to meet your needs. The ticket prices on SlickTickets.com are set by the Ticket Brokers offering the tickets for sale. These prices reflect a fair market value based on the effort to acquire the tickets, convenience fees, delivery fees and other expenses that are calculated into the price that is listed on SlickTickets.com. Ticket Brokers generally sell their tickets at prices above face value. This price is known as the "market value" The Ticket Brokers sell the tickets above face value because they incur additional costs and pay certain premiums in order to obtain the most desirable, high demand and sold-out events. The “market value” is determined by several factors such as seat location, event, demand, date, location, etc. The Ticket Brokers do not disclose to us the face value of the tickets. When SlickTickets.com polls the Ticket Broker’s inventories, we are only given the “market value” price or the price the tickets are being listed for sale. The ticket industry is constantly changing such that prices rise and fall depending on the demand for the ticket and changes to a particular event. If you find a price you are happy with, we suggest you purchase the tickets immediately in order to avoid a possible sell-out or price increase. The Service Fee reflects the cost of obtaining the premium, hard to find, or sold-out tickets. It also helps us to recover some of the costs associated with processing payments as well as guaranteeing that every ticket on the site is authentic. The tickets you ordered are most likely shipped out the day you placed the order. In some cases, this may not be possible and the Ticket Broker will contact you to give you an indication of when the item will be shipped. We suggest that our customers contact the Ticket Broker directly with questions about shipping. Their contact information can be found in the confirmation email sent to you when the order was placed. If you need assistance, please contact us and we would be happy to find out more information for you. All of the orders are processed using FedEx and will have a tracking code sent to your email address so you can track your tickets the entire way to your door. This is YOUR ticket(s). It is most likely that the Ticket Broker acquired the tickets from the original purchaser of the ticket. The tickets are transferable and these are now your tickets for the event. If an event is postponed, tickets will be honored for the rescheduled date. New tickets will not need to be issued for most rescheduled events or postponements. As we are not able to recover our costs on the tickets that we acquired for you, we in turn are unable to offer customers refunds on postponed or rescheduled events. If the event is permanently cancelled, you will receive a refund. If this happens, please contact us and we would be happy to help you request the refund. If an event is cancelled without a rescheduled date, you will need to contact the fulfilling Ticket Broker for a refund. The Ticket Broker’s contact information will be sent to you in a confirmation email upon ordering. If you have any questions or need some assistance in contacting the Ticket Broker, please feel free to send us an email at support [at] SlickTickets.com and we will see if there is any way that we can help.